Pouring a large concrete floor successfully depends largely on the proper preparation of the subsurface. To be able to support the slab, the floor needs a strong, sturdy subsurface, compacted for stability. You'll also need to reinforce the concrete with a grid of rebar to help support the larger slab size. Once completed, though, the slab will be able to support anything from vehicles to walls and a roof. Remove any ground cover and topsoil from the building site with a spade. Compact the soil with a vibratory plate compactor to give yourself a sturdy building surface. Build the form for your concrete, a wooden frame that creates the shape of the slab and keeps the concrete from spreading out when poured. Use 1-inch-thick boards for the form, 11 inches wide to allow for a layer of compacted gravel beneath the slab surface. Cut the form to fit the 30-foot by 40-foot dimensions needed. Connect the form at the corners with anchor bolts. Sink wooden stakes every 16 inches around the perimeter of the form and then screw them to the boards to help keep them upright. Place small horizontal boards outside the forms against joints between boards forming the long sides of the form. Attach the horizontal boards to the form edges with bolts to connect the two edges, creating the longer form sides needed. Dig a trench around the inside edge of the form with a spade to provide a footer for the concrete. Make the trench 4 inches deep and 8 inches wide. This footer will create extra support for anything built onto the slab, such as walls. Fill the inside of the form with a 3-inch layer of gravel. Compress the gravel with the plate compactor and then add a second 3-inch layer, compressing that as well. The gravel will provide you with a drainage layer beneath the slab. Maintain the consistency of the gravel layer throughout the slab, allowing the concrete poured into the footer greater depth than the rest of the slab. Cover the gravel with 6-mil plastic sheeting to form a vapor barrier for the concrete. Place flat top concrete blocks throughout the base of the form about 3 inches in height to support the rebar. Place the rebar over the blocks, spacing each bar 4 feet apart and sizing the bars about 4 inches from the edges of the slab. Use a grid placement consisting of two layers of rebar running perpendicular to one another. Tie the rebar together where the two layers meet using metal ties. The blocks will maintain the rebar in the center of the concrete pour. Mix the concrete in a concrete mixer, following the instructions provided by the concrete manufacturer for water to mix ratios. Pour the concrete into the form, spreading it starting at the point that's farthest away from the mixer. Use a wheelbarrow to move the concrete to the pour areas, and a spade to scoop the concrete in place. Pour the concrete into the form until you reach the top. Level the concrete with the top of the foam by dragging a wood screed across the top. Move the screed back and forth to scrape high areas downward to fill voids in the concrete surface. 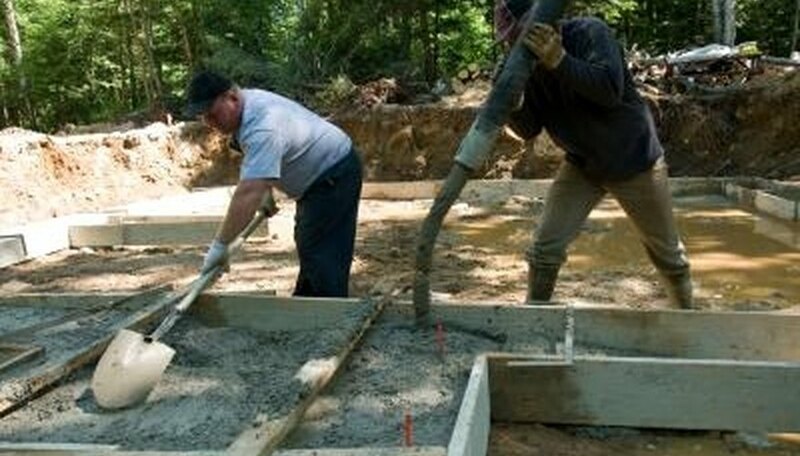 Use a wood float to level the concrete further and to settle aggregate throughout the slab. As you float the concrete, moisture rises to the top. Wait a few minutes for the slab to reabsorb the moisture before continuing. Cut control joints into the slab using a trowel to allow for movement throughout the slab without cracking. Place a 1 1/2-inch-deep line through the width and length of the slab every 10 feet as a joint. Provide a rough finish to the concrete if desired by running a broom across the surface. The broom finish will create a nonskid surface with increased traction. Cover the slab with a plastic sheet, weighing the sheet down on the edges against the ground with bricks. Keep the sheet in place for a week, but remove it momentarily after 24 hours to pull the wood forms from the concrete. Cure the concrete for another two weeks after removing the sheet before stepping onto the slab. Spray the concrete with concrete sealer to add a layer of water resistance to avoid moisture stains. Back-fill the edges of the slab with soil after curing or dig a hole for the floor 11 inches in depth prior to beginning the slab. Wear rubber gloves when working with concrete, as exposure to skin can cause burning.